You may recall about a year ago when I revealed that I sold my beloved dining room table (because God told me to). 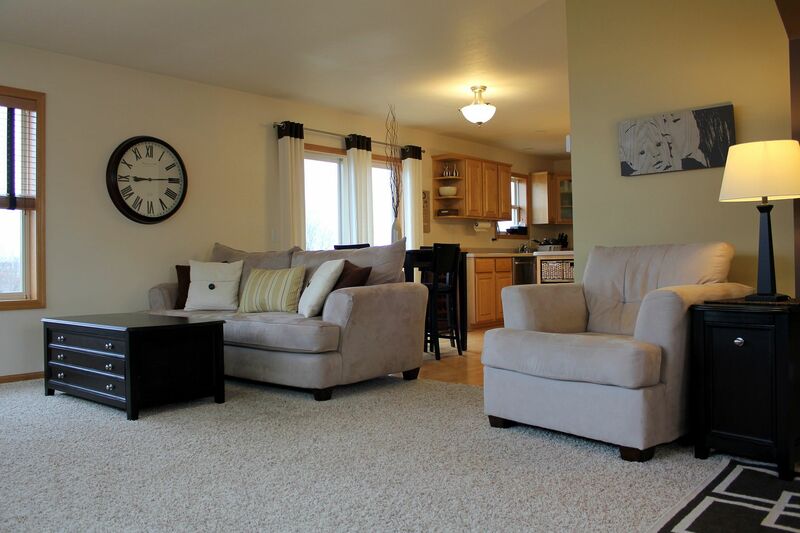 That decision took our great room from its former living room/formal dining room combination to one large family room with tons of wide open space for Kate to play–a decision I’ve never once regretted! Before my little Eat Pray Love epiphany, our living room was confined to the space in front of the arch, and our formal dining room lived in the space behind it. While I was happy to sell my dining room table…I wasn’t quite as eager to say goodbye to the linear chandelier that hung above it. I love that thing and was convinced I could make it work in the space. To do so–and to reach my overall goal of having a lot of wide open space for Kate to play–I pushed the loveseat all the way back to the chandelier and added a console table behind it. This well-lit seating area now makes the perfect little spot for storytime! Our family room today (click to enlarge). 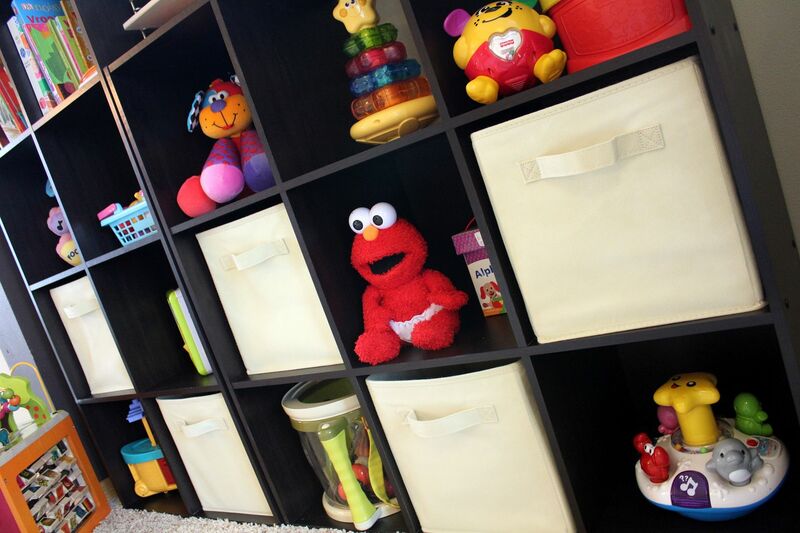 Baskets under the console table hold blankets for the whole family…and yes, that includes baby blankets for Elmo, too. This orange table runner is not only my favorite color, it’s also a $6 steal from Pottery Barn! Folded in half and draped over the ottoman, it adds a fun pop of color to the space–and hides stains! (Which are inevitable, I’m telling you.) 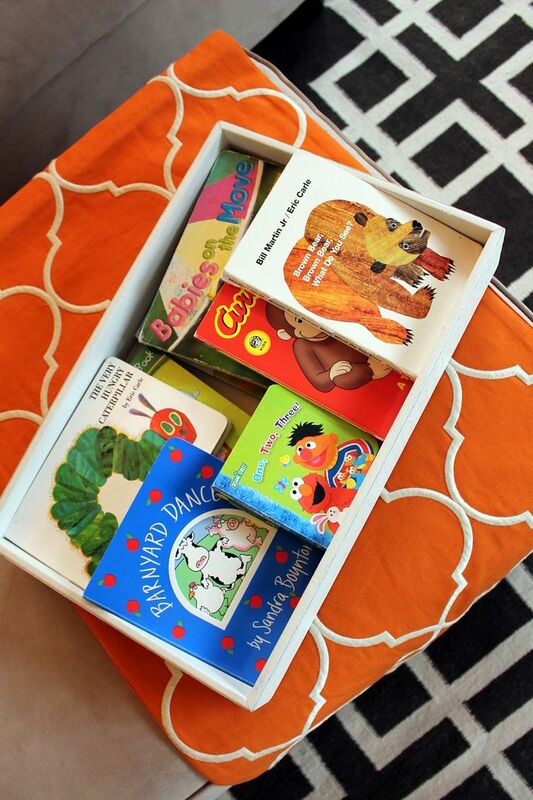 A tray full of Kate’s favorite books sits on top of the ottoman at the perfect height for her to grab. A new chair filled the space to the left and added extra seating. Hanging above the chair is one of my favorite photographs of me and Kate, transformed into a beloved piece of artwork by Modern Bird. 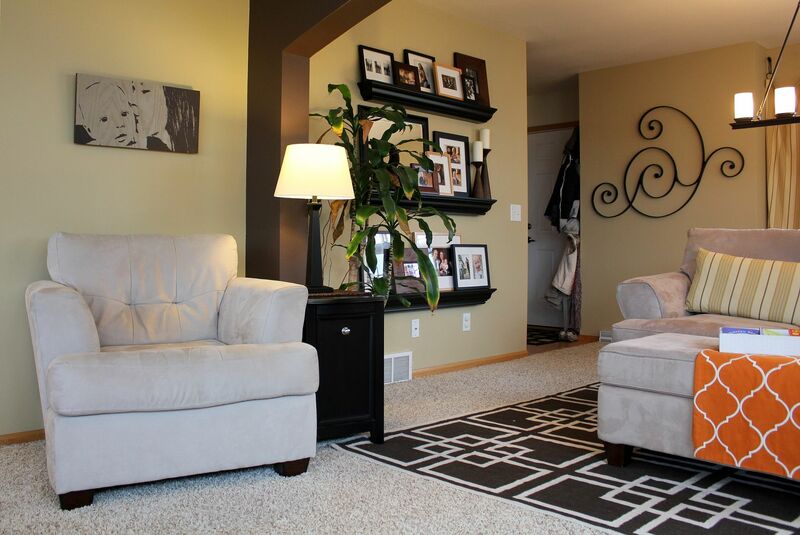 That 12×24″ slab of wood is easily the most talked about and admired piece by guests in our home! 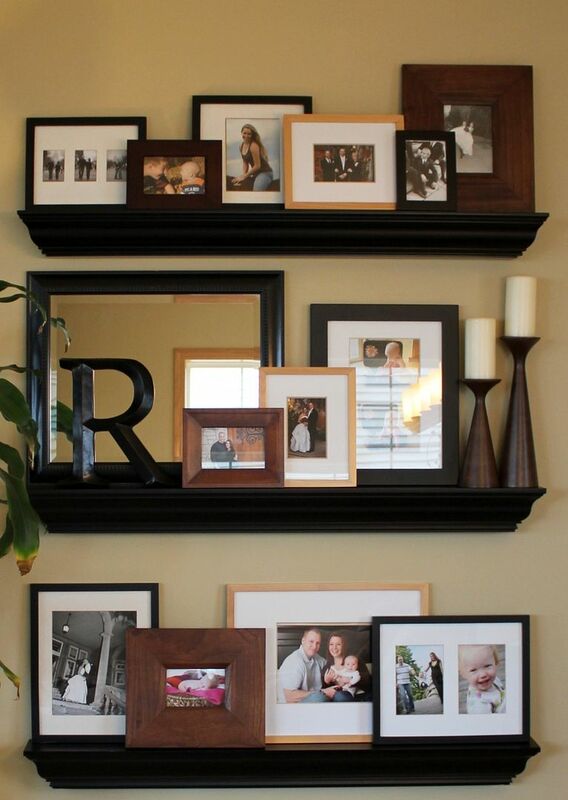 A mix of frame finishes, and black & white and color photos. See, you really can mix it up! The hardest working wall in the house! Kate’s toybox (far right), G’s ginormous TV, and the only other piece of new furniture we bought for the space–storage cubes from Target to hold even more of Kate’s toys and keep them easily accessible for her. And of course, lots of wide-open space in front for playing! Some of Kate’s most beloved things: books, puzzles, a ModTots birdie plaque (okay, that one might be mine), her Laugh & Learn Puppy, blocks and cubes, Baby Tickle Elmo, her favorite Alpha-books, B. drum & music set, and fabric bins filled with balls, Little People animals to go along with her Noah’s Ark, and her B. Zany Zoo activity cube. 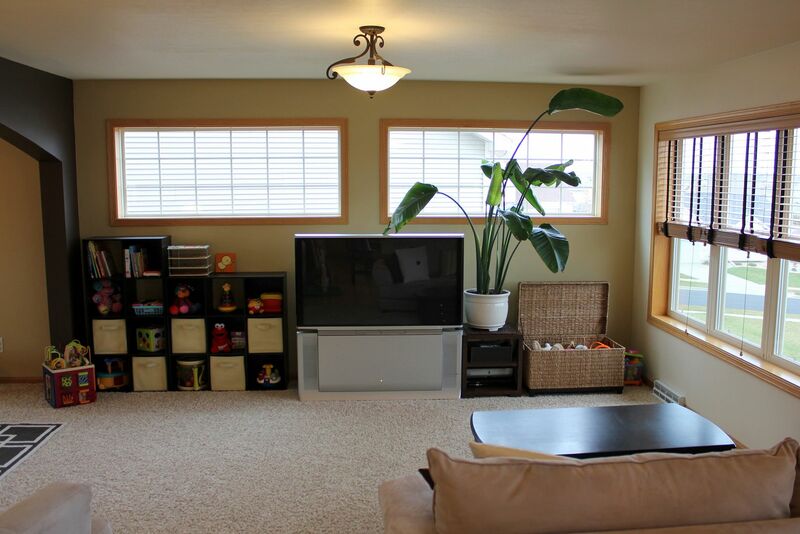 And there you have it–our randomly stained, rarely picked-up updated, kid-friendly family room! Looks perfect! I bet she loves it and so do you and G! You sure made it work girl. Thank you for posting this! My daughter is 10 months old and I’m trying to figure out where to make her play space. It just makes so much sense to have it in our main living space so we can watch her and play with her easily. My husband is not sold on it, but maybe showing him your lovely room will help! Thanks, it looks great! Wow, very nice! I can’t believe a room as chic as this is still so kid-friendly. You’re obviously very thoughtful in your design. Well done! I love it. It looks like a very comfy AND chic layout, and the console table solution is perfect under that fabulous fixture. Good thinking! Our little one does this sweet thing for no touch situations. She puts her hand behind her back and says, “Just looking” as she gazes curiously at whatever it is. It’s working with our tree very well so far, even if it sounds like she’s talking to a salesperson, while she’s standing there. That looks great. I love how wide open the space is now. 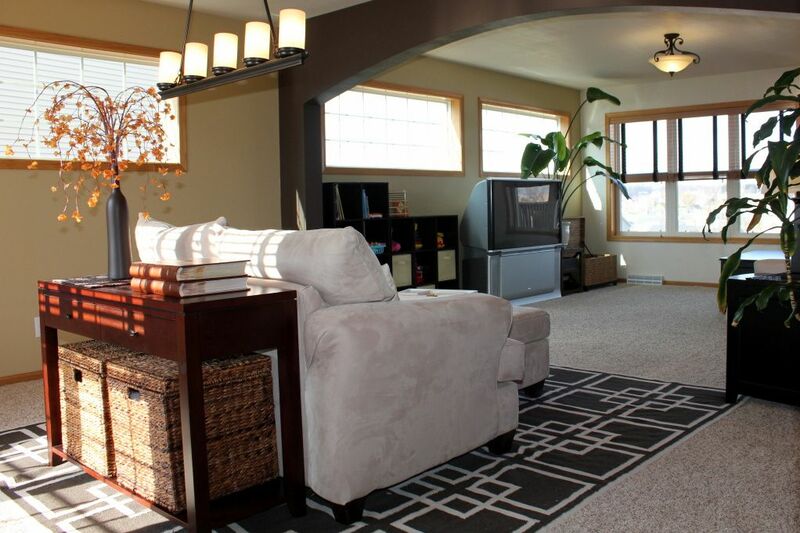 Looks like a great area for the family to hang out! It looks amazing! 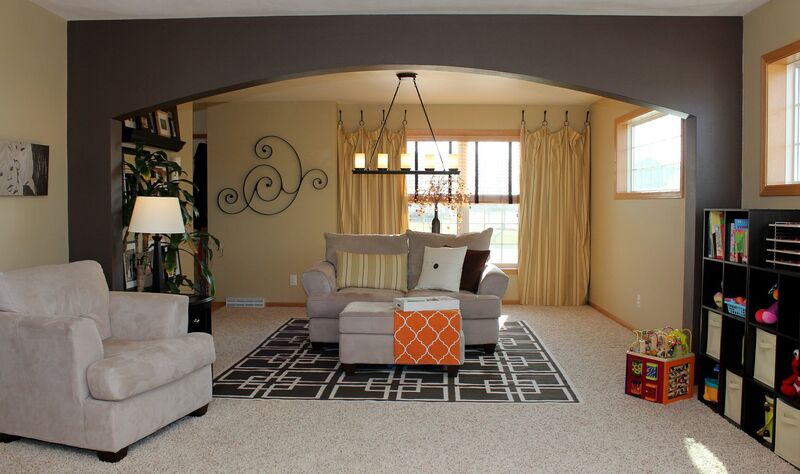 Stylish and well-decorated, but kid-friendly without being too toy-cluttered. Love it, great job! I love the cubes from Target! I have a similar set up in my living/dining room. I was going to get a bookshelf but saw the cubes and went with those. So glad that I did. They have a much more personable feel than a plain bookshelf. Such a great job you CAN have kids and still have a stylish, functional home and you’ve done just that. Having seen Kate play and love this room — makes me love it even more! I love it! 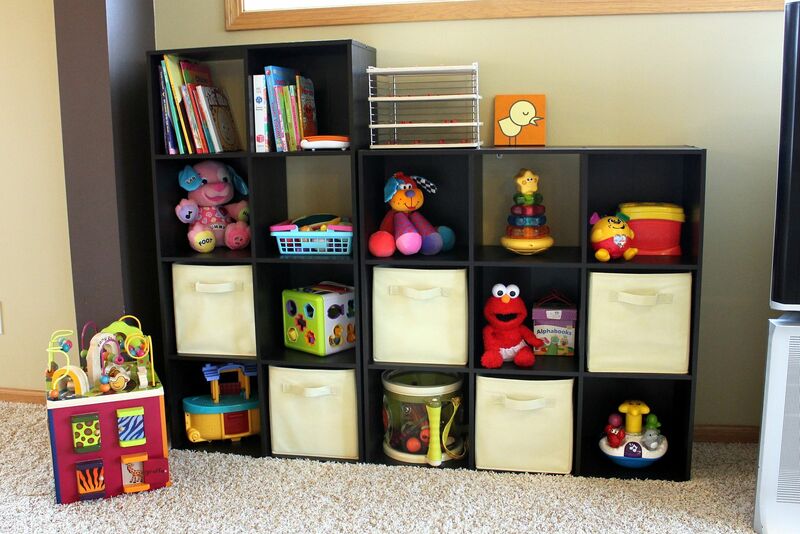 We have the target cube storage too! But what/where/how much is that (wicker? woven?) large-ish trunk like thing from (other side of your tv)? Right now we’re using a (blue, woven) bin from Target that’s just too small to house all the ‘random’ toys that don’t have a home in the cubes, and I don’t want to stick a regular toy box in my living room! Thanks! @Lindsay–That was our preference, too. It just makes more sense at this age to integrate the toys in the space we use most often, versus having a separate play room. Good luck with your transition! @jbhat–That is the sweetest thing ever. What a cutie!